The Polish-Lithuanian Commonwealth, also known as the First Polish Republic or Republic (Commonwealth) of the Two (Both) Nations (Peoples), (Polish: Pierwsza Rzeczpospolita or Rzeczpospolita Obojga Narodów; Lithuanian: Abiejų tautų respublika) or as the "First Republic," was one of the largest and most populous countries in seventeen century Europe. Its political structure—a semi-federal, semi-confederal aristocratic republic—was formed in 1569 by the Union of Lublin, which united the Kingdom of Poland and the Grand Duchy of Lithuania, lasting in this form until the adoption of the Constitution of May 3, 1791. The Commonwealth covered not only the territories of what is now Poland and Lithuania, but also the entire territory of Belarus and Latvia, large parts of Ukraine and Estonia, and part of present-day western Russia (Smolensk and Kaliningrad oblasts). Originally the official languages of the Commonwealth were Polish and Latin (in the Kingdom of Poland) and Ruthenian and Lithuanian. The Commonwealth was an extension of the Polish-Lithuanian Union, a personal union between those two states that had existed from 1386 (see Union of Krewo). The Commonwealth's political system, often called the Noble's democracy or Golden Freedom, was characterized by the sovereign's power being reduced by laws and the legislature (Sejm) controlled by the nobility (szlachta). This system was a precursor of the modern concepts of broader democracy and constitutional monarchy as well as federation. The two comprising states of the Commonwealth were formally equal, although in reality Poland was a dominant partner in the union. The Roman Catholic Church had a significant influence on the affairs of the Commonwealth, the state however was noted for having religious tolerance, although the degree of it varied with time Its economy was mainly based on agriculture. While the Commonwealth's first century was a golden age for both Poland and Lithuania, the second century was marked by military defeats, a return to serfdom for the peasants (the second serfdom phenomena), and growing anarchy in political life. The Duchy of Warsaw, established in 1807, traced its origins to the Commonwealth. Other revival movements appeared during the January Uprising (1863–1864) and in the 1920s, with Józef Piłsudski's failed attempt to create a Polish-led "Międzymorze" ("Between-Seas") federation that would have included Lithuania and Ukraine. Today's Republic of Poland considers itself a successor to the Commonwealth, whereas the pre-World War II Republic of Lithuania saw the old Polish-Lithuanian Commonwealth mostly in a negative light. The creation of the Commonwealth by the Union of Lublin in 1569 was one of the signal achievements of Sigismund II Augustus, last king of the Jagiellon dynasty. His death in 1572 was followed by a three-year interregnum during which adjustments were made to the constitutional system that effectively increased the power of the nobility (the szlachta) and established a truly elective monarchy. The Commonwealth reached its Golden Age in the first half of the seventeenth century. Its powerful parliament (the Sejm) was dominated by nobles who were reluctant to get involved in the Thirty Years' War, sparing the country from the ravages of this largely religious conflict devastating most of contemporary Europe. The Commonwealth was able to hold its own against Sweden, Russia, and vassals of the Ottoman Empire, and at times launched successful expansionist offensives against its neighbors. During several invasions of Russia, which was weakened in early-seventeenth century by the Time of Troubles, Commonwealth troops managed to take Moscow and hold on to it from September 27, 1610, to November 4, 1612, until driven out by a revolt in 1611. Commonwealth power waned after a double blow in 1648. 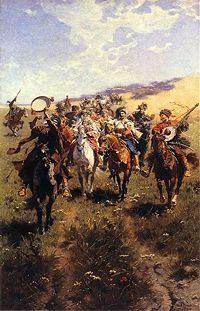 The first blow was history's greatest Cossack rebellion (the Khmelnytskyi Uprising, supported by Crimean Khanate Tatars, in the eastern territories of Kresy), which resulted in Cossacks asking for the protection of the Russian Tzar (1654) thus leading to Russian influence over Ukraine gradually supplanting the Polish. The other blow to the Commonwealth was the Swedish invasion in 1655 (supported by troops of Transylvanian duke George II Rakoczy and Friedrich Wilhelm I, Elector of Brandenburg), known as The Deluge, provoked by the policies of Commonwealth kings from the Swedish royal House of Vasa. In the late seventeenth century, the weakened Commonwealth under King John III Sobieski in alliance with the forces of Holy Roman emperor Leopold I dealt the crushing defeats to the Ottoman Empire: in 1683, the Battle of Vienna marked the final turning point in a 250-year struggle between the forces of Christian Europe and the Islamic Ottoman Empire. For its centuries long stance against the Muslim advances, the Commonwealth would gain the name of "Antemurale Christianitatis" (forefront of Christianity). Over the next 16 years (in the "Great Turkish War") the Turks would be permanently driven south of the Danube River, never to threaten central Europe again. By the eighteenth century, the Commonwealth was facing many internal problems and was vulnerable to foreign influences. The destabilization of the political system brought it to the brink of anarchy. Attempts at reform, such as those made by the Four-Year Sejm of 1788–1792, which culminated in the May 3rd Constitution of 1791, came too late, and the country was partitioned in three stages by the neighboring Russian Empire, Kingdom of Prussia, and the Habsburg Monarchy. By 1795 the Polish–Lithuanian Commonwealth had been completely erased from the map of Europe. Poland and Lithuania re-established their independence, as separate countries, only in 1918 after World War I helped to reshape the European map. Polish-Lithuanian Commonwealth coat of arms. Ciołek i.e., Stanislaus II August coat of arms is placed in the middle of the shield. The sculpture is situated in Poznań. The political doctrine of the Commonwealth of Both Nations was our state is a republic under the presidency of the King. Chancellor Jan Zamoyski summed up this doctrine when he said that "Rex regnat et non gubernat" ("The King reigns but does not govern"). The Commonwealth had a parliament, the Sejm, as well as a Senat and an elected king. The king was obliged to respect citizens' rights specified in King Henry's Articles as well as in pacta conventa negotiated at the time of his election. The monarch's power was limited, in favor of a sizable noble class. Each new king had to subscribe to King Henry's Articles, which were the basis of Poland's political system (and included near-unprecedented guarantees of religious tolerance). Over time, King Henry's Articles were merged with the pacta conventa, specific pledges agreed to by the king-elect. From that point, the king was effectively a partner with the noble class and was constantly supervised by a group of senators. konfederacja (from the Latin confederatio), the right to form an organization to force through a common political aim. The three regions of the Commonwealth enjoyed a degree of autonomy. Each voivodship had its own parliament (sejmik), which exercised serious political power, including choice of poseł (deputy) to the national Sejm and charging of the deputy with specific voting instructions. The Grand Duchy of Lithuania had its own separate army, treasury and most other official institutions. Golden Liberty created a state that was unusual for its time, although somewhat similar political systems existed in the contemporary city-states like the Republic of Venice. (interestingly both states were styled the "Most Serene Republic.") At a time when most European countries were headed toward centralization, absolute monarchy and religious and dynastic warfare, the Commonwealth experimented with decentralization, confederation and federation, democracy, religious tolerance and even pacifism. Since the Sejm usually vetoed a monarch's plans for war, this constitutes a notable argument for the democratic peace theory. monarchs, who struggled to expand their power and create an absolute monarchy. magnates, the wealthiest of the szlachta, who wanted to rule the country as a privileged oligarchy, and to dominate both the monarch and the poorer nobles. szlachta, who desired a strengthening of the Sejm and rule of the country as a democracy of the szlachta. The magnates and the szlachta were far from united, with many factions supporting either the monarch or various of the magnates. "Rejtan—The Fall of Poland," oil on canvas by Jan Matejko, 1866, 282×487cm, Royal Castle in Warsaw. 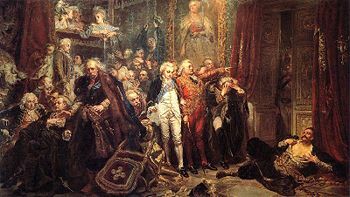 Tadeusz Rejtan (lower right) in September 1773 tried to prevent the legitimization of the first partition of Poland by preventing the members of Sejm from entering the chamber. Once the Jagiellons had disappeared from the scene in 1572, the fragile equilibrium of the Commonwealth's government began to shake. Power increasingly slipped away from the central government to the nobility. In their periodic opportunities to fill the throne, the szlachta exhibited a preference for foreign candidates who would not found another strong dynasty. This policy often produced monarchs who were either totally ineffective or in constant debilitating conflict with the nobility. 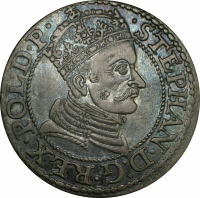 Furthermore, aside from notable exceptions such as the able Transylvanian Stefan Batory (1576–1586), the kings of foreign origin were inclined to subordinate the interests of the Commonwealth to those of their own country and ruling house. This was especially visible in the policies and actions of the first two elected kings from the Swedish House of Vasa, whose politics brought the Commonwealth into conflict with Sweden, culminating in the war known as The Deluge (1648), one of the events that mark the end of the Commonwealth's Golden Age and the beginning of the Commonwealth's decline. 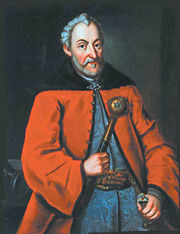 Zebrzydowski's rokosz (1606–1607) marked a substantial increase in the power of the magnates, and the transformation of szlachta democracy into magnate oligarchy. The Commonwealth's political system was vulnerable to outside interference, as Sejm deputies bribed by foreign powers might use their liberum veto to block attempted reforms. This sapped the Commonwealth and plunged it into political paralysis and anarchy for over a century, from the mid-seventeenth- to the end of the eighteenth century, while her neighbors stabilized their internal affairs and increased their military might. 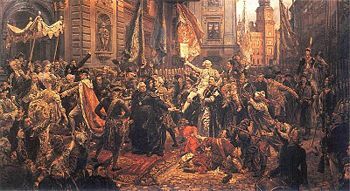 May 3rd Constitution, by Jan Matejko, 1891, oil on canvas, 227×446cm. Royal Castle, Warsaw. preserved religious tolerance (but with a condemnation of apostasy from the Catholic faith). These reforms came too late, however, as the Commonwealth was immediately invaded from all sides by its neighbors who content to leave the weak Commonwealth alone as a buffer, reacted strongly to the king Stanisław August Poniatowski's and other reformers attempts to strengthen the country. Russia feared the revolutionary implications of the May 3rd Constitution's political reforms and the prospect of the Commonwealth regaining its position as a European empire. Catherine the Great regarded the May constitution as fatal to her influence and declared the Polish constitution Jacobinical. Grigori Aleksandrovich Potemkin drafted the act for the Confederation of Targowica, referring to the constitution as the 'contagion of democratic ideas'. Meanwhile Prussia and Austria, also afraid of a strengthened Poland, used it as a pretext for further territorial expansion. Prussian minister Ewald von Hertzberg called the constitution "a blow to the Prussian monarchy", fearing that strengthened Poland would once again dominate Prussia In the end, the May 3rd Constitution was never fully implemented, and the Commonwealth entirely ceased to exist only four years after the Constitution's adoption. Registered Cossacks: Troops made up of Cossacks, used mainly as infantry, less often as cavalry (with tabors) were recruited. Mercenaries: As with most other armies, hired to supplement regular units, such as Germans, Scots, Wallachians, Serbs, Hungarians, Czechs, and Moravians. Private armies: In time of peace usually small regiments (few hundred men) were paid for and equipped by magnates or cities. However, in times of war, they were greatly augmented (to even a few thousand men) and paid by state. Hussars: heavy cavalry armed with lances; their charges were extremely effective until advances in firearms in the late seventeenth century substantially increased infantry firepower. Members were known as towarzysz husarski and were supported by pocztowys. Pancerni: medium cavalry, armed with sabers or axes, bows, later pistols. 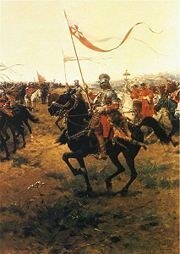 Second important cavalry branch of the Polish army. Cossack cavalry (or just Cossacks): general name for all Commonwealth units of light cavalry, even if they did not contain a single ethnic Cossack; fast and maneuverable like oriental cavalry units of Ottoman Empire vassals, but lacking the firepower of European cavalry such as the Swedish pistol-armed reiters. Tabor: military horse-drawn wagons, usually carrying army supplies. Their use for defensive formations was perfected by the Cossacks, and to a smaller extent by other Commonwealth units. The Commonwealth Navy ws. small and played a relatively minor role in the history of the Commonwealth, but won the very important naval battle of Oliwa, breaking Swedish sea blockade in 1627. On the Black Sea Cossacks with their small boats (czajka) were known for their plundering raids against the Ottoman Empire and its vassals (they even burned suburbs of Istanbul once or twice). And "Grain doesn't pay." The two pictures illustrate that agriculture, once extremely profitable to the nobility (szlachta) in the Polish-Lithuanian Commonwealth, became much less so beginning in the second half of the seventeenth century. The economy of the Commonwealth was dominated by feudal agriculture based on exploitation of agricultural workforce (serfs). Slavery in Poland was forbidden in the fifteenth century; in Lithuania, slavery was formally abolished in 1588, but replaced by the second enserfment. Typically a nobleman's landholding comprised a folwark, a large farm worked by serfs to produce surpluses for internal and external trade. This economic arrangement worked well for the ruling classes in the early era of the Commonwealth, which was one of the most prosperous eras of the grain tradeHowever the country's situation worsened from the late seventeenth century on, when the landed szlachta sought to compensate for falling grain prices by increasing the peasants' workload, thus leading to the creation of second serfdom, a phenomenon common throughout contemporary Eastern Europe. The Commonwealth's preoccupation with agriculture, coupled with the szlachta's dominance over the bourgeoisie, resulted in a fairly slow process of urbanization and thus a fairly slow development of industries. While similar conflicts among social classes may be found all over Europe, nowhere were the nobility as dominant at the time as in the Polish-Lithuanian Commonwealth. There is, however, much debate among historians as to which processes most affected those developments, since until the wars and crises of the mid-seventeenth century the cities of the Commonwealth had not markedly lagged in size and wealth behind their western counterparts. The Commonwealth did have numerous towns and cities, commonly founded on Magdeburg rights. Some of the largest trade fairs in the Commonwealth were held at Lublin. See the geography section, below, for a list of major cities in the Commonwealth (commonly capitals of voivodships). Although the Commonwealth was Europe's largest grain producer, the bulk of her grain was consumed domestically. Estimated grain consumption in the Polish Crown (Poland proper) and Prussia in 1560–1570 was some 113,000 tons of wheat (or 226,000 łaszt (a łaszt, or "last," is a large bulk measure; in the case of grain, about half a ton). Average yearly production of grain in the Commonwealth in the sixteenth century was 120,000 tons, six percent of which was exported, while cities consumed some 19 percent and the remainder was consumed by the villages. The exports probably satisfied about 2 percent of the demand for grain in Western Europe, feeding 750,000 people there. Commonwealth grain achieved far more importance in poor crop years, as in the early 1590s and the 1620s, when governments throughout southern Europe arranged for large grain imports to cover shortfalls in their jurisdictions. Still, grain was the largest export commodity of the Commonwealth. The owner of a folwark usually signed a contract with merchants of Gdansk (German Danzig), who controlled 80 percent of this inland trade, to ship the grain north to that seaport on the Baltic Sea. Many rivers in the Commonwealth were used for shipping purposes: the Vistula, Pilica, Western Bug, San, Nida, Wieprz, Niemen. The river had relatively developed infrastructure, with river ports and granaries. Most of the river shipping moved north, southward transport being less profitable, and barges and rafts were often sold off in Gdańsk for lumber. 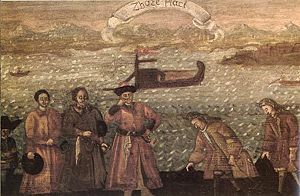 From Gdańsk, ships, mostly from the Netherlands and Flanders, carried the grain to ports including Antwerp and Amsterdam. Gdańsk ships accounted for only 2–10 percent of this maritime trade. Besides grain, other seaborne exports included lumber and wood-related products such as tar and ash. 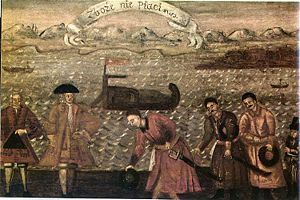 By land routes, the Commonwealth exported hides, furs, hemp, cotton (mostly from Wielkopolska) and linen to the German lands of the Holy Roman Empire, including cities like Leipzig and Nuremberg. Large herds (of around 50,000 head) of cattle were driven south through Silesia. The Commonwealth imported spices, luxury goods, clothing, fish, beer and industrial products like steel and tools. A few riverboats carried south imports from Gdańsk like wine, fruit, spices, and herring. Somewhere between the sixteenth and seventeen centuries, the Commonwealth's trade balance shifted from positive to negative. With the advent of the Age of Exploration, many old trading routes such as the Amber Road lost importance as new ones were created. Poland's importance as a caravan route between Asia and Europe diminished, while new local trading routes were created between the Commonwealth and Russia. Even with improvements in shipping technology the Commonwealth remained an important link between Occident and Orient, as many goods and cultural artifacts passed from one region to another via the Commonwealth. For example, Isfahan rugs, imported from Persia to the Commonwealth, were actually known in the West as "Polish rugs." Also, the price of eastern spices in Poland was several times lower than in western ports, which led to the creation of a distinct Polish cuisine, owing much both to the eastern and western influence. Commonwealth currency included the złoty and the grosz. 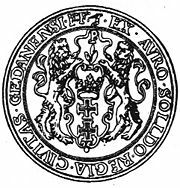 The City of Gdańsk had the privilege of minting its own coinage. The Commonwealth was an important European center for the development of modern social and political ideas. It was famous for its rare quasi-democratic political system, praised by philosophers such as Erasmus; and, during the Counter-Reformation, was known for near-unparalleled religious tolerance, with peacefully coexisting Catholic, Jewish, Eastern Orthodox, Protestant and even Muslim communities. The Commonwealth gave rise to the famous Christian sect of the Polish Brethren, antecedents of British and American Unitarianism. With its political system, the Commonwealth gave birth to political philosophers such as Andrzej Frycz Modrzewski (1503–1572), Wawrzyniec Grzymała Goślicki (1530–1607) and Piotr Skarga (1536–1612). Later, works by Stanisław Staszic (1755–1826) and Hugo Kołłątaj (1750–1812) helped pave the way for the Constitution of May 3, 1791, the first modern codified national constitution in Europe, which enacted revolutionary political principles for the first time on that continent. Johannes Hevelius (1611–1687), astronomer, founder of lunar topography. Julian Ursyn Niemcewicz, (1758–1841), writer, dramatist and poet. Many szlachta members wrote memoirs and diaries. Perhaps the most famous are the Memoirs of Polish History by Albrycht Stanisław Radziwiłł (1595–1656) and the Memoirs of Jan Chryzostom Pasek (c. 1636 – c. 1701). Magnates often undertook construction projects as monuments to themselves: churches, cathedrals, and palaces like the present-day Presidential Palace in Warsaw built by Grand Hetman Stanisław Koniecpolski herbu Pobóg. The largest projects involved entire towns, although in time many of them would lapse into obscurity or be totally abandoned. Usually they were named after the sponsoring magnate. Among the most famous is the town of Zamość, founded by Jan Zamoyski and designed by the Italian architect Bernardo Morando. The prevalent ideology of the szlachta became "Sarmatism," named after the Sarmatians, alleged ancestors of the Poles. This belief system was an important part of the szlachta's culture, penetrating all aspects of its life. Sarmatism enshrined equality among szlachta, horseback riding, tradition, provincial rural life, peace and pacifism; championed oriental-inspired attire (żupan, kontusz, sukmana, pas kontuszowy, delia, szabla; and served to integrate the multi-ethnic nobility by creating an almost nationalistic sense of unity and of pride in the szlachta's Golden Freedoms. In its early, idealistic form, Sarmatism represented a positive cultural movement: it supported religious belief, honesty, national pride, courage, equality and freedom. In time, however, it became distorted. Late extreme Sarmatism turned belief into bigotry, honesty into political naïveté, pride into arrogance, courage into stubbornness and freedom into anarchy. Cossack's wedding. Painting by Józef Brandt. The population of the Commonwealth of Both Nations was never overwhelmingly either Roman Catholic or Polish. This circumstance resulted from Poland's possession of Ukraine and confederation with Lithuania, in both of which countries ethnic Poles were a distinct minority. The Commonwealth comprised primarily four nations: Lithuanians, Poles, Belarusians (referred usually as Ruthenians) and Ukrainians (the latter referred usually as the Ruthenians). Sometimes inhabitants of the Grand Duchy of Lithuania were called Litvins, a Slavic term for Lithuanians, despite different ethnic origins. Shortly after the Union of Lublin, the Commonwealth population was around 7 million, with a rough breakdown of 4.5 million Poles, 0.75 m Lithuanians, 0.7 m Jews and 2 m Ruthenians. In 1618, after the Truce of Deulino, the Commonwealth population increased together with its territory, reaching 11.5 million people, which was composed roughly of 4.5 million Poles, 3.5 million Ukrainians, 1.5 million Belarusians, 750,000 each of Lithuanians and Prussians, half million each of Jews and Livonians. At that time nobility was ten percent of the population, and burghers were 15 percent. In the period from 1648–1657, populations losses are estimated at four million. Coupled with further population and territorial losses, in 1717 the Commonwealth population had fallen to 9 million, with roughly 4.5 m Poles, 1.5 m Ukrainians, 1.2 m Belarusians, 0.8 m Lithuanians, 0.5 m Jews, and 0.5 m others. 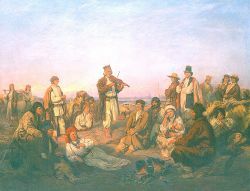 To be Polish, in the non-Polish lands of the Commonwealth, was then much less an index of ethnicity than of religion and rank; it was a designation largely reserved for the landed noble class (szlachta), which included Poles but also many members of non-Polish origin who converted to Catholicism in increasing numbers with each following generation. For the non-Polish noble such conversion meant a final step of Polonization that followed the adoption of the Polish language and culture. 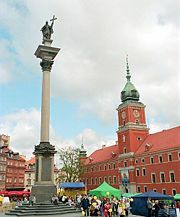 Poland, as the culturally most advanced part of the Commonwealth, with the royal court, the capital, the largest cities, the second-oldest university in Central Europe (after Prague), and the more liberal and democratic social institutions had proven an irresistible magnet for the non-Polish nobility in the Commonwealth. As a result, in the eastern territories a Polish (or Polonized) aristocracy dominated a peasantry whose great majority was neither Polish nor Roman Catholic. Moreover, the decades of peace brought huge colonization efforts to Ukraine, heightening the tensions among nobles, Jews, Cossacks (traditionally Orthodox), Polish and Ruthenian peasants. The latter, deprived of their native protectors among the Ruthenian nobility, turned for protection to cossacks that facilitated violence that in the end broke the Commonwealth. The tensions were aggravated by conflicts between Eastern Orthodoxy and the Greek Catholic Church following the Union of Brest, overall discrimination of Orthodox religions by dominant Catholicism, and several Cossack uprisings. In the west and north, many cities had sizable German minorities, often belonging to Reformed churches. The Commonwealth had also one of the largest Jewish diasporas in the world. Until the Reformation, the szlachta were mostly Catholic or Eastern Orthodox. However, many families quickly adopted the Reformed religion. After the Counter-Reformation, when the Roman Catholic Church regained power in Poland, the szlachta became almost exclusively Roman Catholic, despite the fact that Roman Catholicism was not a majority religion (the Roman Catholic and Orthodox churches counted approximately 40 percent of the population each, while the remaining 20 percent were Jews and members of various Protestant churches). It should be noted that the Counter-Reformation in Poland, influenced by the Commonwealth tradition of religious tolerance, was based mostly on Jesuit propaganda and was very peaceful when compared to excesses such as the Thirty Years' War elsewhere in Europe. Poland, Ukraine, Moldova (Transnistria), Belarus, Russia, Lithuania, Latvia, and Estonia. 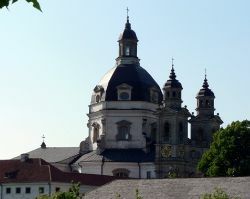 Also some small towns in Slovakia, then within the Kingdom of Hungary, became a part of Poland in the Treaty of Lubowla. the Grand Duchy of Lithuania, colloquially "Lithuania." The Crown in turn comprised two great regions ("prowincjas"): Wielkopolska or Greater Poland and Małopolska or Lesser Poland, and third region was the Grand Duchy of Lithuania. The Commonwealth was further divided into smaller administrative units known as voivodships (województwa). Each voivodship was governed by a voivod (wojewoda, governor). Voivodships were further divided into starostwa, each starostwo being governed by a starosta. Cities were governed by castellans. There were frequent exceptions to these rules, often involving the ziemia subunit of administration: for details on the administrative structure of the Commonwealth, see the article on offices in the Polish-Lithuanian Commonwealth. Silesia (Polish: Śląsk) was not within the Commonwealth, but small parts belonged to various Commonwealth kings; in particular, the Vasa kings were dukes of Opole from 1645 to 1666. Commonwealth borders shifted with wars and treaties, sometimes several times in a decade, especially in the eastern and southern parts. Thought was given at various times to the creation of a Duchy of Ruthenia, particularly during the 1648 Cossack insurrection against Polish rule in Ukraine. Such a Duchy, as proposed in the 1658 Treaty of Hadiach, would have been a full member of the Commonwealth, which would thereupon have become a tripartite Polish–Lithuanian–Ruthenian Commonwealth or Commonwealth of Three Nations, but due to szlachta demands, Muscovite invasion, and division among the Cossacks, the plan was never implemented. For similar reasons, plans for a Polish-Lithuanian-Muscovite Commonwealth also were never realized, although during the Polish–Muscovite War (1605–18) the Polish Prince (later, King) Władysław IV Waza was briefly elected Tsar of Muscovy. The Crown had about double the population of Lithuania and five times the income of the latter's treasury. As with other countries, the borders, area and population of the Commonwealth varied over time. After the Peace of Jam Zapolski (1582), the Commonwealth had approximately 815,000 km² area and a population of 6.5 million. After the Truce of Deulino (1618), the Commonwealth had an area of some 990,000 km² and a population of 10–11 million (including some 4 million Poles). 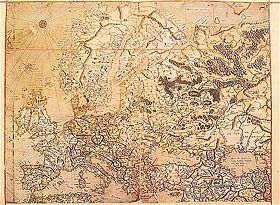 In the sixteenth century, the Polish bishop and cartographer Martin Kromer published a Latin atlas, entitled Poland: about Its Location, People, Culture, Offices and the Polish Commonwealth, which was regarded as the most comprehensive guide to the country. Kromer's works and other contemporary maps, such as those of Gerardus Mercator, show the Commonwealth as mostly plains. The Commonwealth's southeastern part, the Kresy, was famous for its steppes. The Carpathian Mountains formed part of the southern border, with the Tatra Mountain chain the highest, and the Baltic Sea formed the Commonwealth's northern border. As with most European countries at the time, the Commonwealth had extensive forest cover, especially in the east. Today, what remains of the Białowieża Forest constitutes the last largely intact primeval forest in Europe. ↑ Stephen Barbour and Cathie Carmichael, Language and Nationalism in Europe (Oxford University Press, 2000, ISBN 0199250855). ↑ 2.0 2.1 Östen Dahl and Maria Koptjevskaja-Tamm, The Circum-Baltic Languages: Typology and Contact (Philadelphia: John Benjamins Publishing Company, 2001, ISBN 9027230579). ↑ 3.0 3.1 3.2 3.3 3.4 3.5 3.6 3.7 Anatol Lieven, The Baltic Revolution: Estonia, Latvia, Lithuania and the Path to Independence. (New Haven: Yale University Press, 1994, ISBN 0300060785). ↑ Glanville Price, (ed. ), Encyclopedia of the Languages of Europe. (Wiley-Blackwell Publishing, 1998, ISBN 0631220399). ↑ 5.0 5.1 5.2 5.3 5.4 Kevin O'Connor, Culture And Customs of the Baltic States (Westport, CT: Greenwood Press, 2006, ISBN 0313331251). ↑ 6.0 6.1 Daniel Z. Stone, The Polish-Lithuanian State, 1386–1795 (Seattle: University of Washington Press, 2001, ISBN 029598093146). ↑ Karin Friedrich, et al., The Other Prussia: Royal Prussia, Poland and Liberty, 1569-1772 (Cambridge University Press, 2000, ISBN 0521583357). ↑ Czesław Miłosz, The History of Polish Literature. (Berkeley: University of California Press, 1983, ISBN 0520044770). ↑ Jan K. Ostrowski, Land of the Winged Horsemen: Art in Poland, 1572-1764 (New Haven: Yale University Press, 1999, ISBN 0300079184). ↑ Joanna B. Michlic, Poland's threatening other: the image of the Jew from 1880 to the present (Lincoln: University of Nebraska Press, 2006, ISBN 0803232403). ↑ Rosemary A. Chorzempa, Polish roots, 7th ed., (Baltimore, MD: Genealogical Pub., 1993, ISBN 0806313781). ↑ Maciej Janowski, Polish Liberal Thought (Budapest: Central European University Press, 2001. ISBN 9639241180). ↑ Paul W. Schroeder, The Transformation of European Politics 1763–1848. (Oxford University Press, 1996, ISBN 0198206542). ↑ Rett R. Ludwikowski, Constitution-Making in the Region of Former Soviet Dominance (Duke University Press, 1997, ISBN 0822318024). ↑ 17.0 17.1 George Sanford, Democratic Government in Poland: Constitutional Politics Since 1989 (Palgrave, 2002. ISBN 0333774752). ↑ 18.0 18.1 18.2 18.3 18.4 Aleksander Gella, Development of Class Structure in Eastern Europe: Poland and Her Southern Neighbors (SUNY Press, 1998, ISBN 0887068332). ↑ Feliks Gross, Citizenship and Ethnicity: The Growth and Development of a Democratic Multiethnic Institution (Westport, CT: Greenwood Press, 1999, ISBN 0313309329). ↑ Francis Dvornik, The Slavs in European History and Civilization third ed. (Rutgers University Press, 1992, ISBN 0813507995). ↑ Evsey Domar, "The Causes of Slavery or Serfdom: A Hypothesis," Economic History Review 30(1) (March 1970): 18–32. ↑ Martin Van Gelderen and Quentin Skinner, Republicanism: A Shared European Heritage (Cambridge University Press, 2002, ISBN 0521807565). ↑ 24.0 24.1 24.2 John Markoff describes the advent of modern codified national constitutions and states that "The first European country to follow the U.S. example was Poland in 1791." John Markoff, Waves of Democracy. (1996, ISBN 0803990197). ↑ As stated, for instance by the preamble of the Constitution of the Republic of Poland of 1997. ↑ Alfonsas Eidintas and Vytautas Zalys, Lithuania in European Politics: The Years of the First Republic, 1918–1940 (Palgrave, 1999, ISBN 0312224583). ↑ . In 1651, in the face of a growing threat from Poland, and forsaken by his Tatar allies, Khmelnytsky asked the Tsar to incorporate Ukraine as an autonomous duchy under Russian protection. ↑ 28.0 28.1 James S. Pacy and James T. McHugh, Diplomats Without a Country: Baltic Diplomacy, International Law, and the Cold War (Westport, CT: Greenwood Press, ISBN 0313318786). ↑ Juliusz Bardach, O Rzeczpospolitą Obojga Narodów (Warszawa: 1998) (in Polish). ↑ Joanna Olkiewicz, Najaśniejsza Republika Wenecka (Most Serene Republic of Venice), (Warszawa: Książka i Wiedza, 1972) (in Polish). ↑ Joseph Conrad, Notes on Life and Letters (Cambridge University Press, 2004, ISBN 0521561639). ↑ Robert I. Frost, The Northern Wars: War, State and Society in northeastern Europe, 1558–1721 (Harlow, England; New York: Longman's, 2000), 9–11, 114, 181, 323. ↑ William Bullitt, The Great Globe Itself: A Preface to World Affairs (London: Transaction Publishers, 2005, ISBN 1412804906). ↑ John Adams, The Political Writings of John Adams (Washington, DC: Regnery Gateway, 2001, ISBN 0895262924). ↑ 35.0 35.1 Henry Eldridge Bourne, The Revolutionary Period in Europe 1763 to 1815 (original 1914, reprint ed. Kessinger Publishing, 2005, ISBN 1417934182). ↑ 36.0 36.1 Wolfgang Menzel, Germany from the Earliest Period, Vol. 4, (reprint ed. Kessinger Publishing, 2004. ISBN 1419121715). ↑ Isabel de Madariaga, Russia in the Age of Catherine the Great (Sterling Publishing Company, Inc., 2002, ISBN 1842125117). ↑ Carl L. Bucki, The Constitution of May 3, 1791, Text of a presentation made at the Polish Arts Club of Buffalo on the occasion of the celebrations of Poland's Constitution Day on May 3, 1996. Retrieved September 12, 2015. ↑ Piotr Stefan Wandycz, The Price of Freedom: A History of East Central Europe from the Middle Ages to the Present (Routledge (UK), 2001, ISBN 0415254914). ↑ Perry Anderson, Lineages of the Absolutist State (Verso, 1985, ISBN 086091710X). ↑ Andrzej Wasko, "Sarmatism or the Enlightenment: The Dilemma of Polish Culture," Sarmatian Review XVII(2)(April 1997). Retrieved September 12, 2015. ↑ Total and Jewish population based on Frazee; others are estimations from Pogonowski's Poland: a Historical Atlas. Charles A. Frazee, World History the Easy Way (Barron's Educational Series, ISBN 0812097661). ↑ 43.0 43.1 43.2 Based on "1618 population map" (115), "1618 languages map" (119), "1657–1667 losses map" (128), and "1717 map" (141) from Iwo Cyprian Pogonowski, Poland: a Historical Atlas (Hippocrene Books, 1987, ISBN 0880293942). ↑ Linda Gordon, Cossack Rebellions: Social Turmoil in the Sixteenth Century Ukraine, (SUNY Press, 1983, ISBN 0873956540). Adams, John. The Political Writings of John Adams. Washington, DC: Regnery Gateway, 2001. ISBN 0895262924. Ališauskas, V., and L. Jovaiša, M. Paknys, R. Petrauskas, E. Raila, and others. Lietuvos Didžiosios Kunigaikštijos kultūra. Tyrinėjimai ir vaizdai, 2001. ISBN 9955445262. Anderson, Perry. Lineages of the Absolutist State. Verso, 1985, ISBN 086091710X. Barbour, Stephen, and Cathie Carmichael. Language and Nationalism in Europe. Oxford University Press, 2000. ISBN 0199250855. Bourne, Henry Eldridge. The Revolutionary Period in Europe 1763 to 1815. Kessinger Publishing, 2005. ISBN 1417934182. Bullitt, William. The Great Globe Itself: A Preface to World Affairs. London: Transaction Publishers, 2005. ISBN 1412804906. Chorzempa, Rosemary A. Polish roots. Baltimore, MD: Genealogical Pub., 1993. ISBN 0806313781. Conrad, Joseph. Notes on Life and Letters. Cambridge University Press, 2004. ISBN 0521561639. Dahl, Osten, and Maria Koptjevskaja-Tamm. The Circum-Baltic Languages: Typology and Contact. John Benjamins Publishing Company, 2001. ISBN 9027230579. Davies, Norman. God's Playground: A History of Poland: A History of Poland, Vol. 1: The Origins to 1795. and God's Playground: A History of Poland Vol. 2: 1795 to the Present. Columbia University Press, 1982. Vol. 1 ISBN 0231053517. and Vol. 2 ISBN 0231053533.
de Madariaga, Isabel. Russia in the Age of Catherine the Great. Sterling Publishing Company, Inc., 2002. ISBN 1842125117. Dvornik, Francis. The Slavs in European History and Civilization, third ed. Rutgers University Press, 1992. ISBN 0813507995. Frazee, Charles A. World History the Easy Way. Barron's Educational Series, 1997. ISBN 0812097661. Friedrich, Karin. The Other Prussia: Royal Prussia, Poland and Liberty, 1569-1772. (Cambridge Studies in Early Modern History) Cambridge University Press, 2006. ISBN 0521027756. Frost, Robert I. The Northern Wars: War, State and Society in northeastern Europe, 1558–1721. Harlow, England; New York: Longman's, 2000. Gella, Aleksander. Development of Class Structure in Eastern Europe: Poland and Her Southern Neighbors. SUNY Press, 1998. ISBN 0887068332. Gordon, Linda. Cossack Rebellions: Social Turmoil in the Sixteenth Century Ukraine. SUNY Press, 1983, ISBN 0873956540. Gross, Feliks. Citizenship and Ethnicity: The Growth and Development of a Democratic Multiethnic Institution. Westport, CT: Greenwood Press, 1999. ISBN 0313309329. Janowski, Maciej. Polish Liberal Thought. Budapest: Central European University Press, 2001. ISBN 9639241180. Lieven, Anatol. The Baltic Revolution: Estonia, Latvia, Lithuania and the Path to Independence. New Haven: Yale University Press, 1994. ISBN 0300060785. Lukowski, Jerzy Tadeusz. 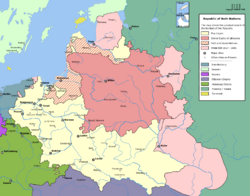 Liberty's Folly: The Polish-Lithuanian Commonwealth in the Eighteenth Century, 1697–1795. New York: Routledge, 1991. ISBN 0415032288. Ludwikowski, Rett R. Constitution-Making in the Region of Former Soviet Dominance. Duke University Press, 1997. ISBN 0822318024. Markoff, John. Waves of Democracy: Social Movements and Political Change. Thousand Oaks, CA: Pine Forge Press, 1996. ISBN 0803990197. Menzel, Wolfgang. Germany from the Earliest Period, Vol. 4. Kessinger Publishing, 2004. ISBN 1419121715. Michlic, Joanna B. Poland's threatening other: the image of the Jew from 1880 to the present. (Lincoln: University of Nebraska Press, 2006. ISBN 0803232403. Miłosz, Czesław. The History of Polish Literature. Berkeley: University of California Press, 1983. ISBN 0520044770. O'Connor, Kevin. Culture And Customs of the Baltic States. Greenwood Press, 2006. ISBN 0313331251. Ostrowski, Jan K. Land of the Winged Horsemen: Art in Poland, 1572-1764. New Haven: Yale University Press, 1999. ISBN 0300079184. Pacy, James S., and James T. McHugh. Diplomats Without a Country: Baltic Diplomacy, International Law, and the Cold War, 1st Ed. Westport, CT: Greenwood Press, ISBN 0313318786. Pasek, Jan Chryzostom. Memoirs of the Polish Baroque: The Writings of Jan Chryzostom Pasek, a Squire of the Commonwealth of Poland and Lithuania. Berkeley: Univ of California Press, 1980. ISBN 0520027523. Price, Glanville (ed.). Encyclopedia of the Languages of Europe. Wiley-Blackwell Publishing, 1998. ISBN 0631220399. Sanford, George. Democratic Government in Poland: Constitutional Politics Since 1989. Palgrave, 2002. ISBN 0333774752. Schroeder, Paul W. The Transformation of European Politics 1763–1848. Oxford University Press, 1996. ISBN 0198206542. Snyder, Timothy. 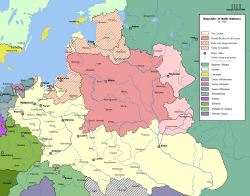 The Reconstruction of Nations: Poland, Ukraine, Lithuania, Belarus, 1569–1999. New Haven; London: Yale University Press, 2003. ISBN 030010586X. Stephan, Halina. Living in Translation: Polish Writers in America. Amsterdam: Rodopi, 2003. ISBN 9042010169. Stone, Daniel Z. The Polish-Lithuanian State, 1386–1795. (A History of East Central Europe; 4). Seattle, WA: University of Washington Press, 2001. ISBN 0295980931. Van Gelderen, Martin, and Quentin Skinner. Republicanism: A Shared European Heritage. Cambridge University Press, 2002. ISBN 0521807565. Wandycz, Piotr Stefan. The Price of Freedom: A History of East Central Europe from the Middle Ages to the Present. Routledge (UK), 2001. ISBN 0415254914. Zamoyski, Adam. The Polish Way: a Thousand-Year History of the Poles and Their Culture. Hippocrene Books, 1993. ISBN 0781802008. This page was last modified on 30 March 2019, at 20:18.